MONTPELIER, Vt. – Trees & Hills comic group releases its first book collection of comics this week at the MoCCA Arts Festival in New York City. 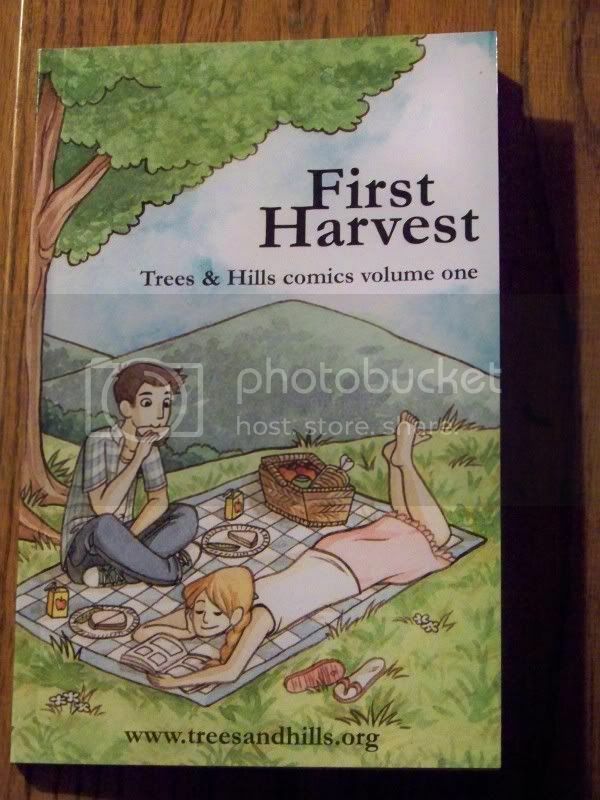 “First Harvest: Trees & Hills comics volume one” features more than 150 pages of cartoons from two dozen creators in Vermont, New Hampshire and western Massachusetts. The book contains reader favorites from Trees & Hills’ first four mini-comic anthologies, published between Fall 2006 and Summer 2008, along with new work by creators in the New England region. Contributors include industry legends such as Stephen R. Bissette and Mark Martin and up-and-coming talent like Colleen Frakes and Marek Bennett. “First Harvest” will be available on June 6 & 7 at the Trees & Hills table at the MoCCA Arts Festival. The book features a color cover by Vermont artist Megan Baehr and will sell for $10. The book will also be available to purchase from the Trees & Hills Web site one week after the show. Trees & Hills comic group formed in 2006 with the mission of developing a strong community among cartoonists and other comic creators in Vermont, New Hampshire and western Massachusetts. Last year, the group published the successful “Seeds: An Anthology of Comics About Food” mini-comic, featuring comics about nutrition, eating organic and local and alternative food lifestyles. “Seeds” sold out just months after the debut and is now in its second printing. Copies of “Seeds” will also be available at MoCCA this week. The $5 comic comes with a recipe booklet and a packet of organic seeds from a Vermont farm. New Hampshire cartoonist and Trees & Hills co-founder Colin Tedford said the publication of “Seeds” last year has inspired the group to a new focus on socially-progressive comic anthologies. “First Harvest” closes the door on the first chapter of the group, he explained. Fall 2009 sees the release of “Shelter,” a new Trees & Hills mini-comic anthology focusing on issues of housing and homes. The comic will debut at the Small Press Expo in Maryland on Sept. 26. “First Harvest” contributors include Megan Baehr, Matt Levin, Chris Grotke, Matthew Reidsma, Anne Thalheimer, Mark Martin, Bryan Stone, Colleen Frakes, Morgan Pielli, Stephen R. Bissette, Daniel Bissette, Meagan Frappiea, Colin Tedford, Keith Moriarty, Blake Parker, Benjamin Kalish, Miles Cota, Ray Prado, M.R. Wilson, Bill Couture, Marek Bennett, Jade Harmon, Mark Gonyea, Jennifer Omand, Matthew Young, Tim Hulsizer, Cayetano Garza Jr. and Gregory Giordano.